DIGITAL | INTERACTIVE | EXPLOSIVE! Fusing Comics, Film, Music and More to Create Exciting Transmedia Comics. THE DISSIDENT IS AN INTERNATIONAL POLITICAL THRILLER SET IN THE NEAR FUTURE. A young american dissident escapes to Amsterdam only to discover there is nowhere you can run from injustice. Follow the adventures of Hans Nobel, an American exile who escapes to Amsterdam after America's democracy collapses. Hans soon discovers that you can't run from tyranny when he uncovers a corrupt Dutch leader's conspiracy involving eco-assassins, kidnapping, human experiments, and a plot to kill anyone who resists the despot's plan to take over Europe. With the help of an underground resistance network Hans resurrects a legendary outlawed newspaper to expose the truth and spark a revolution. Read THE DISSIDENT for FREE each day at TheDissidentDaily.com! Also Available Weekly at Tapastic! NEW GRAPHIC NOVEL OUT NOW! FREE DOWNLOAD! - GirlFIEND CHAPTER ONE! The Pander Brothers are back and bloodthirsty with Girlfiend, their new vampire crime thriller! 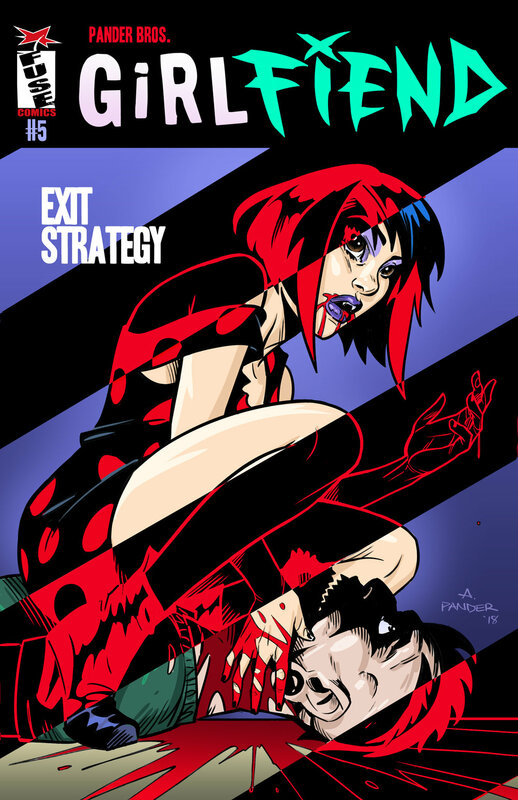 this meaty graphic novel finds them going back to what they do best: Taking comics to the edge. Known for their groundbreaking art in Grendel: Devil's Legacy, their terrifying Exquisite Corpse series, and their revolutionary epic THE DISSIDENT, the Pander Brothers now sink their teeth into this pulp-infused thriller in which a human and his vampire girlfriend hunt the criminal underworld to keep their love alive. Nothing could go wrong with that plan, right? Print edition graphic novel available now on Amazon! FREE "SECRET BROADCAST" COMIC DOWNLOAD! A tale of analogue audio rebellion, SECRET BROADCAST follows the adventure of Toby, a renegade pirate radio broadcaster whose mission to reach spiritual enlightenment through the frequency puts him in the crosshairs of the FCC. Originally released in the flagship Oni Press series Oni Double Feature #1, Secret Broadcast is a cross-media comic with an accompanying soundtrack, SECRET BROADCAST REDUX, that can be heard online. Look for the track numbers throughout the issue! Special added features include a sketch book of development artwork, and bio spotlights of music producers featured on the comic book soundtrack, SECRET BROADCAST REDUX. CLICK TO BUY THE "SECRET BROADCAST REDUX" SOUNDTRACK ON iTUNES! "Tasty Bullet Exposed!" Watch the Conspiracy Web Series and Discover the Truth Behind TASTY BULLET! GET YOUR DIGITAL COPIES NOW! TASTY BULLET Graphic Novel - "Hacked" Edition! GirlFIEND ISSUE #1 - FREE!